Rated PG-13 for a disturbing image and a crude gesture. Hollywood 1927. 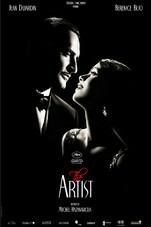 George Valentin (Jean Dujardin) is a silent movie superstar. The advent of the talkies will sound the death knell for his career and see him fall into oblivion. For young extra Peppy Miller (Berenice Bejo), it seems the sky's the limit - major movie stardom awaits. THE ARTIST tells the story of their interlinked destinies.